This cute little doggie has his party hat on and his cake in front of him, ready to blow out each colorful candle. 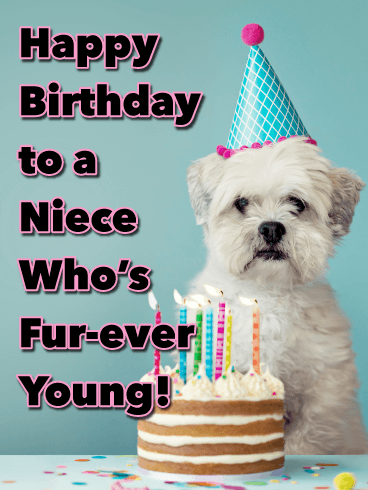 It’s a funny way to remind your niece that no matter how many candles are on the cake this year, she’ll be fur-ever young! This adorable birthday card is sure to have her howling with laughter while knowing how much she’s loved. The kitty on this birthday card’s got real “cat-titude,” but when it comes to wishing your niece a happy birthday, this fab feline is all about celebrating, complete with party hat and candle-topped cupcake! So whatever age she’s turning, let your niece know she’s on your mind while making her laugh with the purr-fect pick to send. 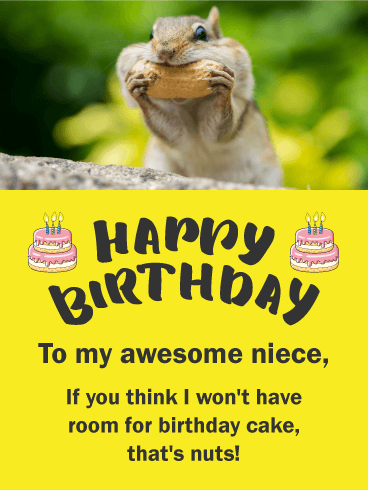 Wish your terrific niece a happy birthday with this cute and funny birthday card. 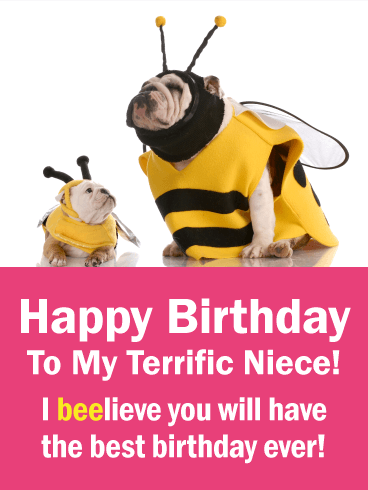 The dog is stating that he beelieves your niece will have the best birthday ever. So adorable! This birthday card features great festive colors of bright pink and yellow. Send these dogs on their way so they will bee able to wish your niece the birthday she deserves! Give your niece the gift of laughter on her special day by sending this funny birthday card. It features a squirrel shoving a large peanut in his mouth while stating that it's nuts to think he will not have room for birthday cake also! The little birthday cake icons give this birthday card an element of celebration and will have your niece looking forward to her birthday cake! This fabulous looking dog with pretty flowers in her hair is so classic! It will give your niece a good laugh on her birthday! Your niece will love the fact that you took the time to find such a perfect birthday card for her. This birthday card features cheerful colors of bright pink, blue, and yellow, all coming together to make a joyous birthday card that your niece is going to really like! 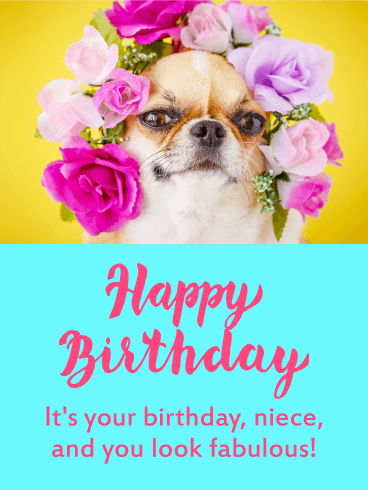 If you are looking for a totally cute and humorous birthday card for your niece, you just found it! 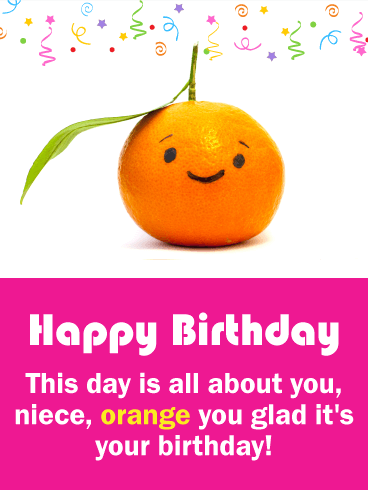 This birthday card features a fun play on words and displays a happy orange that will put a smile on your niece's face as well as give her a little laugh. 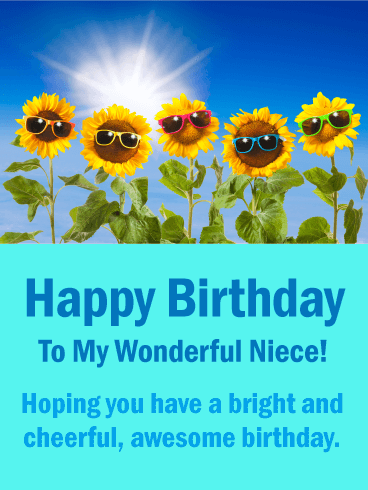 Send this great birthday card over to your niece to get her birthday off to a wonderful start! 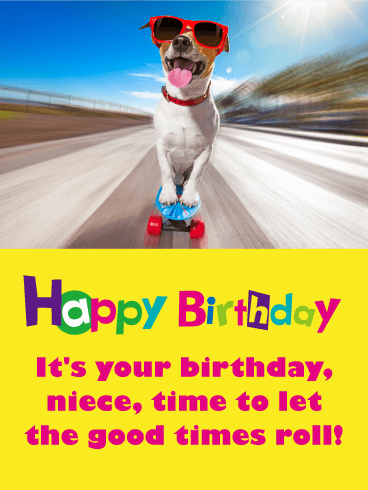 Give your niece a good laugh on her birthday with this colorful funny happy birthday card! Everyone should have the happy birthday song sung to them on their special day, even if it is this little guy doing the singing. This birthday card features wonderful bright colors of pink, blue, and yellow, giving it a great birthday celebration look. Send this birthday card off to your niece right away to wish her a happy birthday today! These dogs are certainly excited about your niece's birthday and are having a super fun time celebrating! 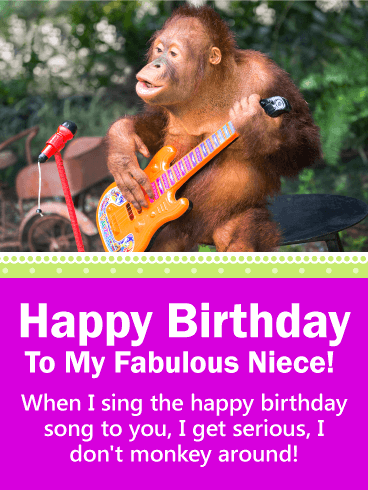 Send this funny and cute happy birthday card over to your niece so she can get a good laugh! She will really appreciate that you took the time to choose such a great birthday card for her special day. 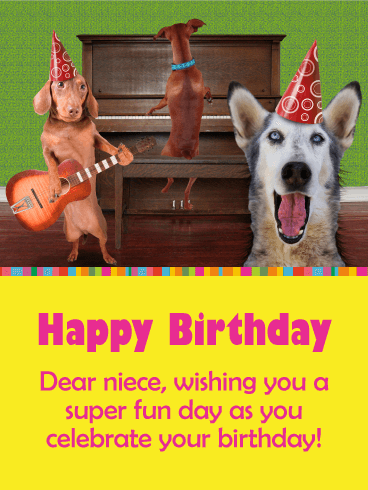 These dogs can't wait to play a birthday tune for your niece, so send them over right away! 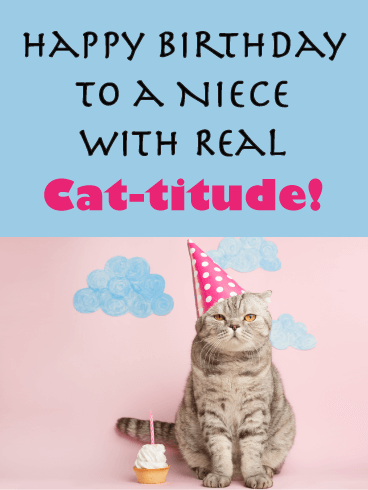 If you are looking for an adorable cat birthday card to send to your lovely niece, then your search is over! 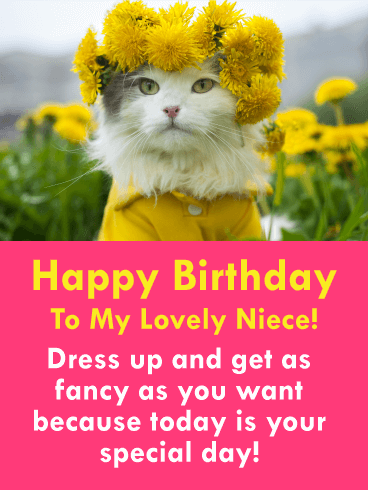 This happy birthday card will give your niece a little laugh, and she will just adore the fact that the cat is wearing yellow flowers in her hair, as well as a matching coat. So cute! It will remind your niece that it's her special day so she can get fancy and dress up for the occasion! Good times are what we hope for everyone on their birthday, so why not send your niece this fun and happy birthday card with the classic saying, "let the good times roll"! It will give your niece a little laugh. It features a dog riding a skateboard and it looks like he is really having a good time! Let this happy pup roll on over to your niece to make sure she has a great birthday. This is certainly a cheerful and cute happy birthday card your niece will love. It features a funny image of sunflowers wearing colorful sunglasses, and will surely make your niece laugh when she sees it. 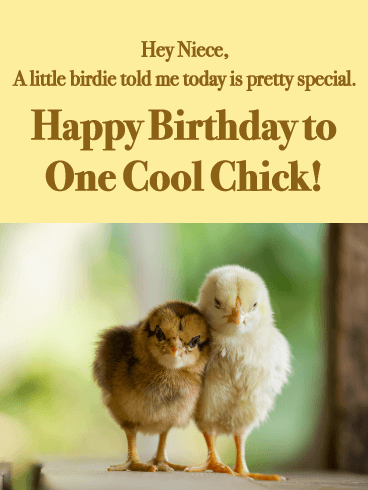 Send this birthday card off to your wonderful niece to wish her a bright awesome birthday with this funny birthday card, it will make her day! 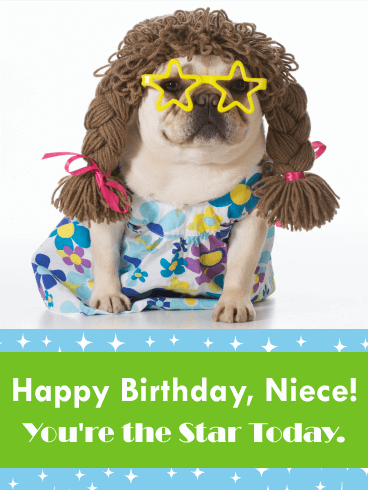 Let your niece know that she is a star today with this humorous birthday card. The cute dog wearing the star glasses is adorable and funny, your niece is going to love it! Today is her special day and she should shine above the rest, and this little dog wants to make sure she knows that. Send him on his way so he can get your niece's birthday started in a great way!